Underwater sound fields are used for numerous commercial and military applications, including imaging, oil exploration, and mapping the ocean. Sponsored by the U.S. Navy, the Dalecki laboratory is investigating the interaction of underwater sound fields with biological tissues, such as lung, heart, brain, and intestine. Using specially designed acoustic sources operating at frequencies ranging from ~100 Hz to 500 kHz, the Dalecki lab is studying the mechanisms of interaction of continuous wave and impulsive sound fields with biological systems. Results of this work will help to establish safe exposure guidelines for human divers and marine life exposed to underwater sound fields. 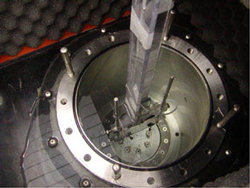 Exposure chamber for generating low frequency sound in the laboratory. This line of research has been funded by the United States Navy.